Where do we go when the storm is coming? 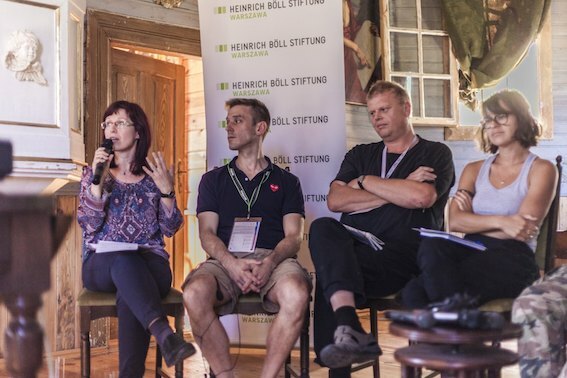 The fifth edition of Green Summer University (ZLU), organized by the Green Zone Foundation and the Green European Foundation in collaboration with the Heinrich Böll Foundation took place from July 12th to 15th under the slogan “Crossing Borders”. 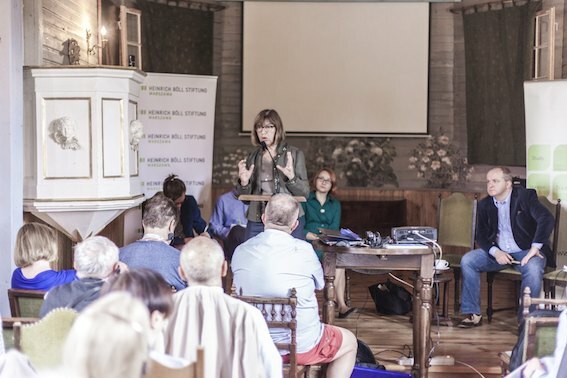 Various supporters of “greening up” European societies met in Janów Podlaski, nearby the Polish-Ukrainian border, where the dialogue between different cultures, religions and languages is especially intense. The program of this year’s Green Summer University (ZLU) was congruent with the well-known scheme – starting from more general topics, such as the future of Europe, then gradually moving on towards more specific ones, contextualized in relation to geopolitics and the upcoming European Parliament elections. Paweł Kowal (Institute of Political Studies at the Polish Academy of Sciences, Natolin’s College of Europe) underlined the importance of today’s discussions on the reforms in EU, especially for Central and Eastern European countries, by pointing out to false understandings of the concept of “multi-speed Europe”. According to him, we can choose to keep the existing integration model based on relative solidarity, or opt for “Europe the Onion” model – in which the EU would be based on a solid and rather imperialist core, which would engage in ambiguous and non-necessarily equal relations with the further “onion layers”. Is the moment of truth approaching? The second option would unfortunately open up the possibilities for external powers to intervene and impose their interests on EU, but on the other hand, it could also trigger the emergence of a truly communitarian European identity, countering both the narratives of the end of Euroatlantic order and repelling the pressures from the East. Reacting to Kowal’s analysis, Michał Sutowski (Political Critique) emphasized that this positive scenario is loaded with serious risks. The progressive movements could turn out to be unwilling to cooperate with “European nationalisms”, while the countries of our region might choose the fussy alliance with Trump rather than the predictability of such politicians as Angela Merkel. According to Rebecca Harms (member of EP, Greens-European Free Alliance), the situation is even more complicated, as the progressive elites of European politics cannot reach an agreement with their voters. Naturally protecting democracy in member states has to be supported by EU institutions, but this battle can be finally won only on the national level. Progressive European politics, in order to be effective, has to create a sense of social security and reliability, instead of undermining it with continuous changes. The following substantial and multithreaded discussions clearly showed that each year the Green Summer University strengthens its position as a forum of exchange for people and initiatives, across ideological borders. By using multiple forms of this exchange (debates, seminars and workshops), participants approached four main topics: protection of rivers, green agriculture, climate change and the preparations for the COP24 climate conference in Katowice, as well as cities’ participatory development. By referring to examples of such cities like London, Barcelona, Ghent, Łódź and Lublin, the debate on urban and municipal issues concentrated on very specific challenges, such as the fight against corruption, improving public transport and increasing social equality. Guests from Belarus, Czech Republic, Germany, Sweden and Ukraine discussed the planned E40 waterway ranging from Odessa to Gdańsk as well as the E30 based on the river Oder throughout the Polish-Czech-German borders region. They paid specific attention to the necessity of protecting European rivers against the negative effects of the construction of huge “water highways”. Agriculture was another focus point of Green Summer University, with five events dedicated specifically to this topic, as well as the current issue of “Green News”. The intense debate entitled “From industrial agriculture to agroecology and food sovereignty”, featuring experts and activists from the Institute of Rural and Agricultural Development at the Polish Academy of Sciences (IRWIR PAN), Warsaw University of Life Sciences (SGGW), Nyeleni Poland and “Dobrze” Food Cooperative, was followed by workshops. What turned out to be especially fruitful was the meeting with 25 farmers in the local Agricultural Advisory Centre – the screening of the movie Crops of the Future triggered a vivid discussion on the state of agriculture, as well as obstacles one has to face when switching to more sustainable methods of agricultural production. Listen here to the debate “From industrial agriculture to agroecology and food sovereignty”. Climate change and the upcoming COP24 climate conference in Katowice, too, where discussed by a wide range of participants from various organizations, such as Action Democracy, ClientEarth: Lawyers for the Planet, Eco Union, Green European Journal, Foundation for the Institute for Sustainable Development, Foundation “Development YES – Open-Pit Mining NO”, Communal Anti-atom Monitor and Green News. Activists concentrated particularly on the necessity of creating an effective media coverage, which would coherently bring forward such issues as the Sustainable Development Goals, legal aspects of investments in Polish power engineering and the social consequences of climate change to the broader public. They emphasized that Poles increasingly want their energy to change, and activities connected to that should include the implementation of progressive climate politics on both national and local levels, e.g. a new vision for coal-mining regions such as Silesia, recognizing the strong interconnections between the issues of smog and climate change, as well as promoting eco-friendly behaviors and attitudes. The Green Summer University also featured the premiere of the brochure Facts and Myths of Climate Politics, issued by the Climate Coalition in collaboration with Heinrich Böll Foundation. Developing various activist coalitions is an obviously important, but by no means the only way to effectively spread green ideas. Coming up with reliable sets of information on complex issues is one thing, but we should not forget about the generally limited scope of their impact, especially if they do not reach out both to the consciousness and heart of the members of the general public. The conference’s culmination point was enriched by artistic events – a reading of poetry created during the activist defense of Białowieża Forest, the beautiful happening Sisters of the River led by Cecylia Malik (Polish Mothers opposing tree felling), as well as a discussion on socially engaged art. They offered a perfect opportunity to reflect upon the goals and personal dimension of ecological activism. See also Sisters of the River during the 7th Aquatic Critical Mass. Are the young involved in social and public activities to better their environment? Or are they a passive and, perhaps, entitled audience? The answer is never simple or obvious. As part of the conference "The future of the civic participation of the young" in Iława, we discussed the subject versus the object nature of the inclusion of young people in decision-making processes – whether the young are users, or those being used, in the ongoing trend of their presence as a political topic. Finally, together with practitioners from the fields of education and local government, we wondered how to make the dialogue between young people and adults real and sensible.